Some weeks are so full of so many tasks, when everything finally winds down, a little comfort food is in order. While baked chicken is always a winner, I wanted to change things up a bit, do something more individualized. I’ve always wanted to cook Cornish game hens. They’re so small yet fancy. When served with roasted carrots and an Anderson Valley wine, our cares just slipped away. We paired our hens with 2012 Husch Renegade Sauvignon Blanc. The way the wine picked up the rosemary in the bird was dynamite! I savored every mouthful. Preheat oven to 450 degrees F. Season birds, inside and out, with salt and pepper. Squeeze juice from half a lemon into the cavity of each bird, then place the half inside the cavity. 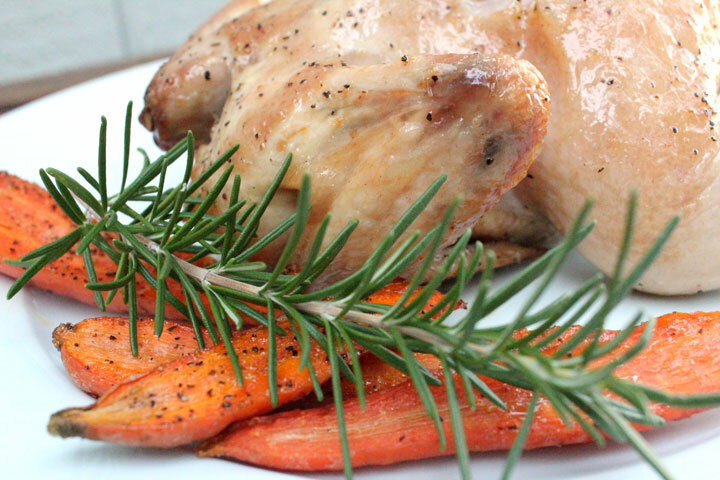 Place the rosemary sprigs inside of each bird. Rub hens with olive oil and place them on a rack inside a roasting pan. Place garlic around birds. Roast for 25 minutes then lower oven to 350 degrees. Pour the wine and broth into the pan and roast about 30 minutes more or until the birds are golden brown and the legs begin to fall away from the body. Cut hens in half and serve.